Villa Orpheus is a beautifully constructed villa located in the verdant countryside in the gently undulating hills of Pano Stalos commanding superb views of the Aegean sea. 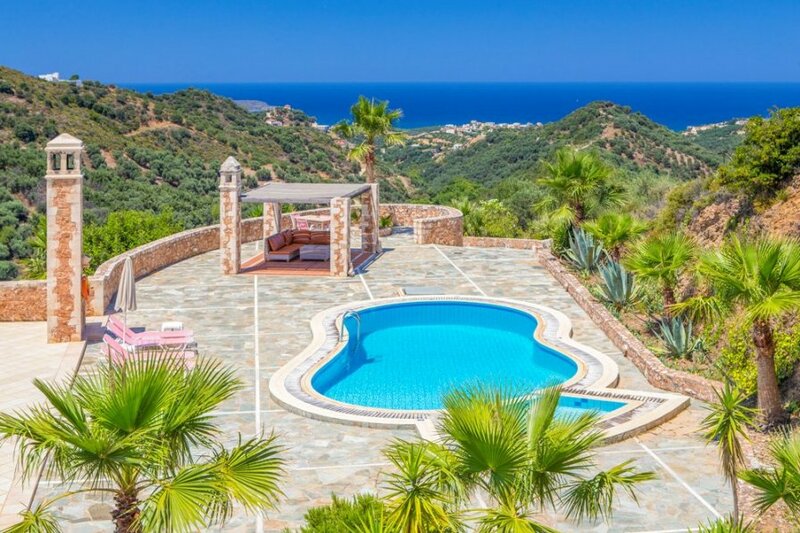 Villa Orpheus is a beautifully constructed villa located in the verdant countryside in the gently undulating hills of Pano Stalos commanding superb views of the Aegean sea, the White Mountains and beyond. Enjoying a peaceful rural position yet only 3.5 km from the popular beach of Kato Stalos, Villa Oprheus boasts three magnificent bedrooms, a spacious lounge and a brand-new kitchen. The lovely outdoor spaces will allow you to take full advantage of the incredible all-year-round sunny weather: a magnificent oval-shaped pool with separate child pool area surrounded by a huge terrace equipped with parasols, comfortable sunbeds and a very handy shaded area with sofas, ideal to take a relaxing afternoon nap! Perfect for family getaways, you won't regret choosing this luxurious stone-built villa as your next holiday destination. Pano Stalos is a lovely traditional rural Greek village in West Chania, in the beautiful and always sunny island of Crete. Local amenities include three typical "tavernas"serving exquisite food, a minimarket and a kafenion. The closest beach is Kato Stalos, only 3.5 km away. Here, stunning sandy beaches scattered with lively bars, restaurants and water-sport centres will make sure all your need are catered for!